This week we bring you the stories of three seniors in the news who are everyday inspirations. We can all admire the 96-year-old who rides and jumps horses on the regular, the real-life Horse Whisperer who is using his techniques to help veterans, or the one and only Rosie the Riveter who reclaimed her place in history after 70 years. These seniors are just doing what they do, and giving caregivers, loved ones and home care aides moving role models in the process. Redding, California native Naomi Parker-Fraley is 95, and just this year was confirmed as the inspiration for the woman in the iconic Rosie the Riveter poster. The poster artist worked from a photo published in many newspapers in 1942 of Naomi as she was working at the Naval Air Station in Alameda. For many years, the world thought another woman, who had worked in a factory in Michigan during the war, was the model for Rosie. Admittedly, they resemble each other quite a bit, so the misidentification was uniformly accepted. But in 2009, at the Rosie the Riveter/World War II Home Front National Historical Park, Naomi and her sister saw the plaque commemorating Rosie, with someone else’s name under the photograph. She tried to get the Park Service to correct the mistake, but until a Seton Hall University professor took up her cause in 2015, she had no success. After he published his findings, history caught up with Naomi, and she’s now ready to inspire another generation of women. 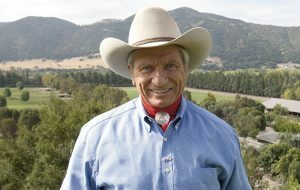 At 81, real-life Horse Whisperer Monty Roberts is still helping horses with his Join-Up method of horse training which aims to replace the concept of ‘breaking’ a horse with one of trust and cooperation. His philosophy of using body language, common sense and patience to connect with horses also applies to reaching the hard-to-reach. Autistic children, abused children, and most recently veterans all benefit from his ideas. Monty has been working with Queen Elizabeth II’s horses for 25 years, and just last month planned a meeting with Prince Harry. A veteran himself, Prince Harry’s charitable work supports veterans, and wants to learn Monty’s techniques that can help veterans overcome the stresses of reintegrating into civilian life. Ninety-six year old Dinnie Greenway of London, Ontario in Canada has been riding horses since before she could walk. She rides every day on horses she bred herself, jumping and riding cross country without fear, despite having broken her neck twice during her long riding career. Dinnie was one of the first women to ride competitively on the world stage, and went to the 1936 Olympics in Berlin as a horse trainer. She remembers Hitler’s speech, and Jesse Owens winning his medals, and knew that horrible conflict was on its way. After the war, she launched her long international career as a show jumper and judge, with a win at Toronto’s Royal Winter Fair in 1949, considered the first modern show jumping competition. Dinnie does experience aches and pains, and recently strained a hip muscle from a fall in her house, but has no intention of giving up riding. She doesn’t smoke or drink, and after three marriages, she’s given up on men, because she likes older men, and at 96, she doesn’t meet many that qualify. So she’s sticking with horses.